Safety tray restricts hand-access. Sharps are released away from the user into the collector; removing risk of “bouncing” or rollback of sharps. Impenetrable by contained sharps. Tested to an amazing 500 wash cycles, Daniels Sharpsmart is the only sharps container in the United States which has not had any FDA incident reports citing needle penetration. Clearview window identifies the fill level of the collector without showing messy contents. Temporary locking closure provides safe movement of collectors. Large aperture allows for single-handed disposal of sharps; contents protection shield eliminates risk of needlestick injuries. 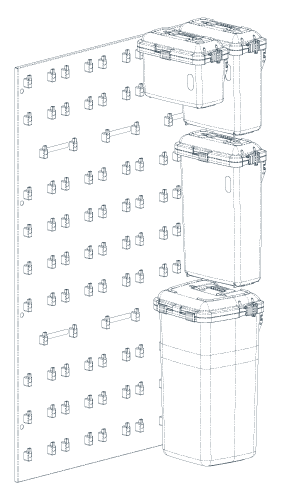 Tray defaults to a FULL locked position when contents reach the maximum fill capacity, eliminating overfilling and associated risks. Precisely engineered lid seal eliminates leakage of blood or body fluids during transport. Permanent side locks prevent collector from being reopened when full. Eliminates unauthorized access to contents. 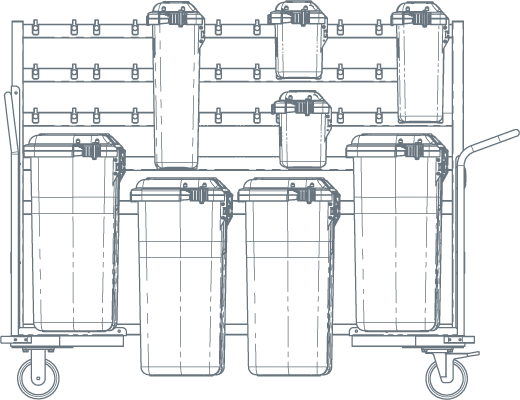 Daniels’ patented engineered accessory systems are designed to optimize space, overcome logistical challenges, and enable point-of-use disposal. 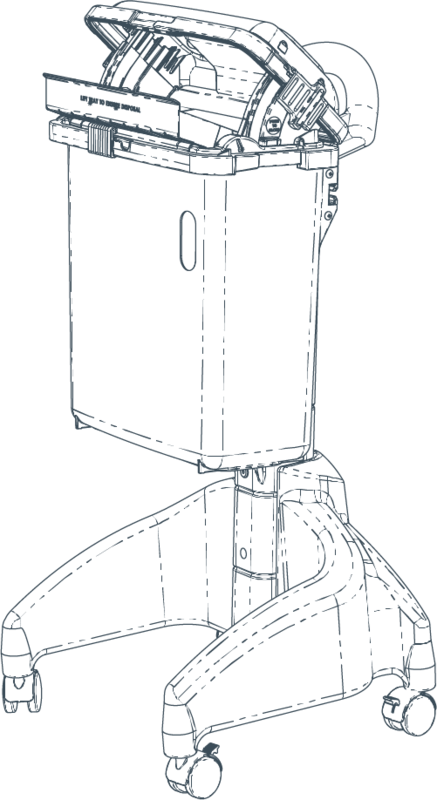 Providing safe cradle to grave waste management, the Daniels suite of mounting brackets, trolleys and carts ensure that Daniels collectors are always suspended from the ground, and their engineered mobility provides safe bedside disposal and seamless movement between different work environments and applications. Daniels range of mounting accessories enable interchangeable wall, trolley or mobile cart mounting for point-of-use placement and safe accessibility of sharps collectors. Bulk wall mounted storage within a ward’s utility room enables quick interchange of clean and full collectors, and our small-footprint stands give versatility to all space-restrictive areas. The process of mounting ensures collectors never touch the ground and remain uncontaminated in a clinical environment. Within the hospital environment, the positioning and access needs of sharps collectors vary from ward to ward; from dialysis to critical care, from surgery to cardiology, from clinical to a hospitals' loading dock, our interchangeable accessories cater for seamless risk-free movement across an entire facility. With an intelligent suite of accessories that enable point of use mobility, and maneuverability of single or bulk collectors in tight spaces, no system in the world achieves the same labor, time and safety efficiencies in a hospital environment. Daniels’ interchangeable containment systems are supported by a range of mounting accessories that ensure collectors are always suspended from the ground, greatly reducing the risk of cross-contamination. Designed to integrate seamlessly into the hospital environment, Daniels solutions include wall mounts, interchangeable trolley cradles, bench brackets, and bulk movement solutions sized specific to standard hospital corridors. Daniels versatile wall mounting systems for clean rooms, and bulk storage units for loading dock, ensure that valuable hospital footprint is preserved, and the interchange of full and empty containers is seamless.